i Click 'view all' to instantly compare this ok deal with offers on other top chocolate & candy gift boxes. 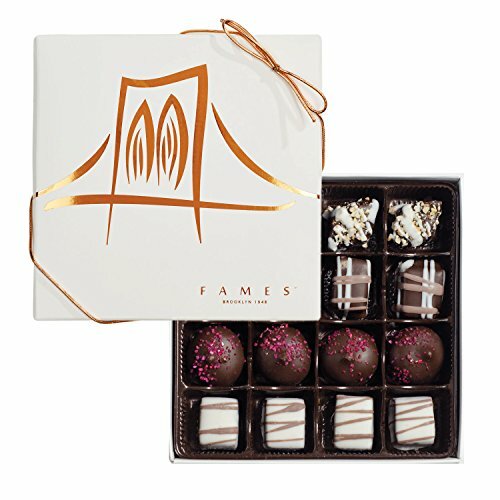 Fames Assort Handcrafted Chocolates Gift Box, Kosher Pareve, 16pc is currently selling at $14.50, which is its normal price. It has a lowest price of $14.50 and is selling within its usual range. Price volatility is 0.89% (meaning it does not change often), so you might have to wait a while for the price to drop. Until then this is a recommended 'ok deal'. The current deal is also the best price on this item over the last month. Compare the current price, savings (in dollars & percent) and Buy Ratings for the top Chocolate & Candy Gift Boxes that are closely related to Fames Assort Handcrafted Chocolates Gift Box, Kosher Pareve, 16pc. Here is how Fames Assort Handcrafted Chocolates Gift Box, Kosher Pareve, 16pc compares with other leading Chocolate & Candy Gift Boxes. Chocolate has always been the luxury gift of choice, and the four flavors in this enticing assortment take its level of cachet up a notch. The enticing rows of mouth-watering chocolate are guaranteed to excite every chocolate lover. Berry SwirlA luscious berry center is enveloped by layers of creamy chocolate ganache and dark chocolate coating, topped with shimmering pink crystals. Indulge in this creative combination of textures and flavors. Coffee FudgeSink your teeth through rich white chocolate top layer to reach the bold espresso fudge center. Savor the intense coffee flavor in every morsel. A coffee lover's dream! Creamy DreamyThis artisan combination of rich dark chocolate and soft creamy truffle encases its surprise swirl center. Savor the taste, as the dreamy taste of luxury lingers for hours. Nutty DiamondIndulge your taste buds with the intense flavor of dark chocolate and peanut butter crispy center. Topped with white chocolate drizzle and cashew sprinkles for a delicious taste of nuttiness! 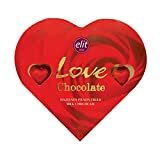 Taste the Love in Every BiteWhether unique housewarming gifts for couples, thoughtful gifts for women, secretary gifts, or chocolate holiday presents, Fames chocolates are guaranteed to delight - if not we promise to provide you a full refund. Good Things Come in Small BatchesIn keeping with tradition, Fames chocolate is produced in small batches. David Frankel, Fames' president, explains, "our goal is to produce an utterly delicious product. Because we work in small batches, we have the flexibility to create the best in gourmet chocolates."